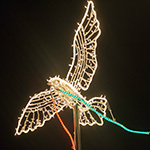 The Lighting of the Doves Festival is a long-standing tradition in The Woodlands that signifies the start of the holiday season in the community. Symbolizing peace during the holidays, the ceremonial illumination of the giant doves has attracted thousands of visitors each year. Concessions will be available for purchase onsite. Vendors may accept either cash or credit. *Inflatables, Snow Play Areas and Snow Slides require a wristband. Wristbands are $10 each and provide unlimited access to the activities for the duration of the event. *All times and entertainment subject to change.